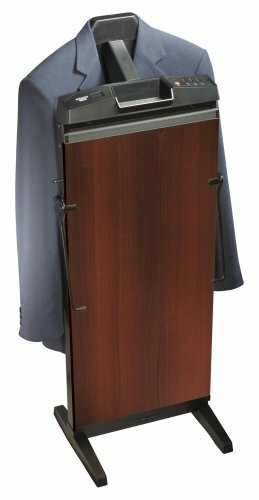 Corby 7700 3-Cycle Pants Press with Automatic Shut Off and Manual Cancel Options, Walnut Finish by Corby at Doctor Joe Says. MPN: 7700W. Hurry! Limited time offer. Offer valid only while supplies last. The Corby 7700 3-Cycle Pants Press is designed to flatten wrinkles and keep creases sharp and stylish without dealing with the hassle of an iron. The Corby 7700 3-Cycle Pants Press is designed to flatten wrinkles and keep creases sharp and stylish without dealing with the hassle of an iron. This pants press features discreet push button timers that let you choose from 15-minute, 30-minute and 45-minute press cycles. Perfect for business slacks to casual slacks, this press eases trousers back into shape by gently removing wrinkles or refreshing creases. The 7700 features a convenient auto off feature once a cycle is completed, as well as manual cancel option at your demand. This pants press also comes with a storage shelf that can hold loose change, keys, valuables and other items you need to set aside. The 7700 has a unique, mountable design for extra stability and an LED countdown display to keep track of the cycle’s progress. A beautiful walnut finish adds an elegant aesthetic to this pants press, making it ideal to go with the décor in your bedroom or in luxury hotels. The 7700 is ETL-listed, which means that it has passed Nationally Recognized Testing Laboratory (NRTL) inspections for quality customer service, product safety standards and capabilities. The Corby 7700 3-Cycle Pants Press comes with a 1-year limited warranty that protects against any defects due to faulty material or workmanship. If you have any questions about this product by Corby, contact us by completing and submitting the form below. If you are looking for a specif part number, please include it with your message.